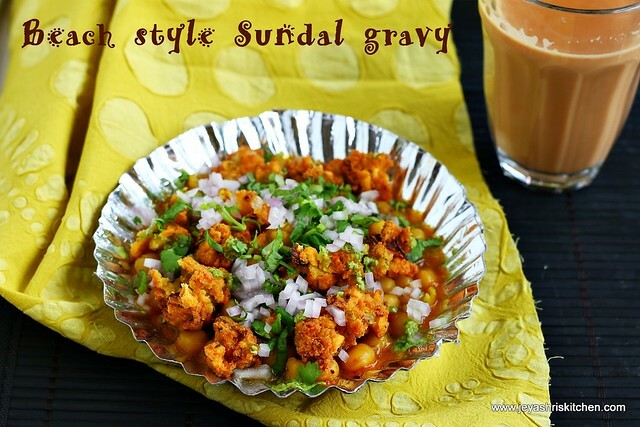 Beach style sundal gravy is basically a sundal gravy, topped with masala vadai and chutney. 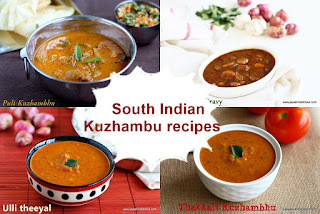 This recipe was first introduced to me by my nephew when i visited chennai few months back. He bought a box full of this sundal gravy from a nearby shop and told me to taste this. He told that is a south Indian version of Ragda Patties or Masala poori chaat. 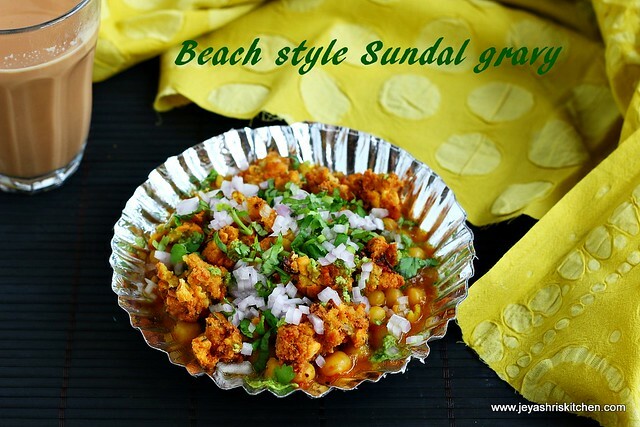 I was totally addicted by the taste of the gravy and decided to post the recipe of this beach sundal gravy here soon. But somehow, it couldn't happen. 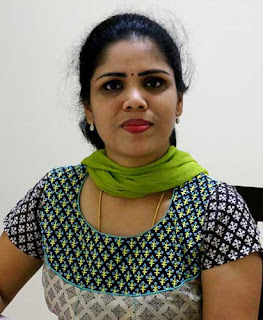 Just the day before the starting of Navaratri, a very good friend of hubby and who is quite close to all of us, messaged me, if i have the recipe of Beach sundal gravy in Jeyashri's Kitchen. 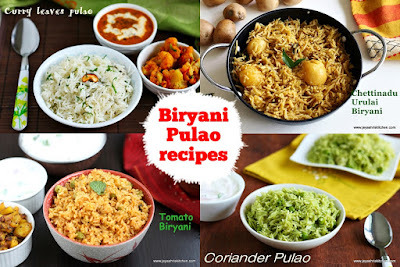 And since i decided to post only no onion no garlic recipes during that time, i told i will try it and send you the recipe the next day. 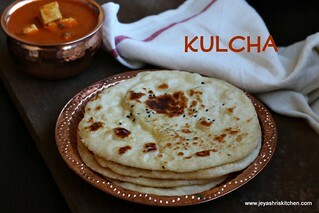 As promised, for the first time, i sent the recipe to him before publishing it in the website. An exclusive preview show. I have never done this before but he being special to all of us, i did this for him. 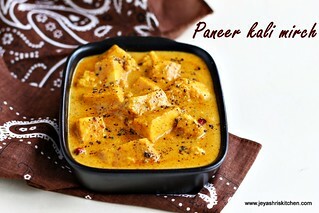 This recipe was a super hit at home and everyone enjoyed this. 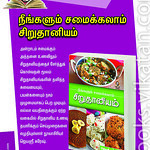 Check out my beach style thenga maanga pattani sundal recipe too. Soak the white peas for 8-10 hours or overnight. Pressure cook the white peas for 4-5 whistles by adding little salt to it. Crush the garlic pods and finely chop the onion and tomato. In a pan add the oil and mustard seeds, curry leaves and crushed garlic. If you don't have fennel powder, add 1/2 tsp of fennel seeds now. Saute for a while and add the chopped onions. Saute it till it turns pink. Add the chopped tomatoes to this. Add in the red chili powder, coriander powder, fennel powder(skip if you have added fennel seeds while tempering), turmeric powder and salt. Cook till the raw smell of the powders go off and the tomato becomes mushy. Now add the cooked peas to this. Do not drain the water if any. Add 1 and 1/2 cups of water to this. Check for salt. Let this gravy boil for 15 minutes in a medium flame. Stir in between. The gravy should be bit watery only, so if it thickens too much add little more water. Keep this in a very low flame once it reaches a right consistency. Switch it off after 5 minutes. 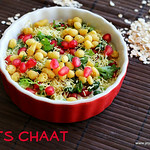 Drain the water from the soaked channa dal and grind this coarsely along with red chili, curry leaves and fennel seeds. Grind without adding water to this. Add salt and finely chopped onions to the ground mixture. While it is heated up, make the green chutney. This green chutney i adapted from Venkatesh bhatt show. Grind the mint leaves, coconut, green chili and salt. Add little water while grinding. Mix the ground vada batter well. Take the batter in small bits and put it in the hot oil. If i say in tamil, killi podavum. Once it is done keep it aside. In a serving plate add one ladle of peas gravy. Add the fried masala vadai bits on the top. 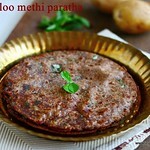 Sprinkle some green chutney on the top and garnish with coriander leaves. Serve immediately. Sprinkle some onions on the top before serving. Instead of white peas you can add green dried peas too. Fennel seeds will give the exact touch of beach style gravy, so do not omit this. Adding green chutney is optional, but i highly recommend that. 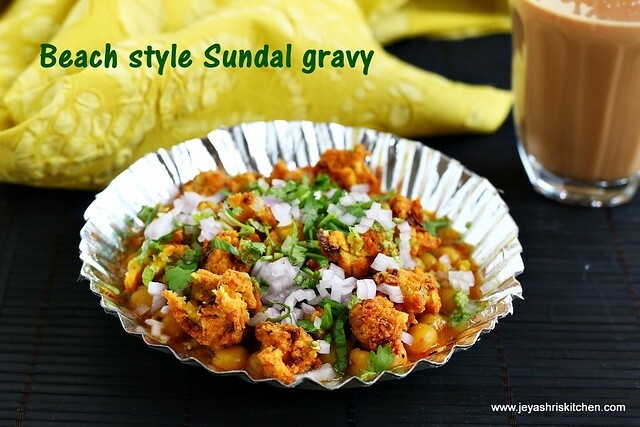 Technorati Tags: beach sundal gravy,chennai beach style recipes,pattani sundal gravy,sundal gravy,how to make beach sundal gravy,jeyashris kitchen recipes,chennai street food. Love the clear and crisp pictures jeyashri..Its such a long process of making the gravy and vadai ,u are doing a great job . 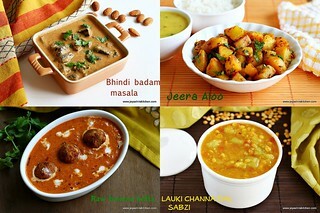 Cup is usually measured as 200gm in Indian measurements or 250gm using the measuring cup in US. Hi for green chutney is it coriander or coconut?? Hi, It's coconut, The south Indian way.